Vogue 1556 by Yves Saint Laurent (1966) Model: Merle Lynn. Photo: Richard Dormer. Image: PatternVault shop. 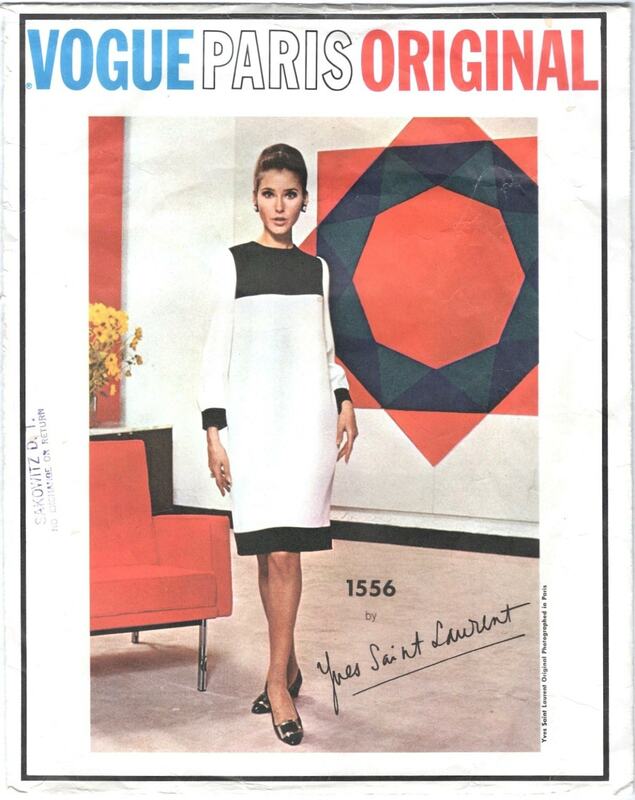 Vogue 1556, a shift dress by Yves Saint Laurent, is a design from the Fall 1965 ‘Mondrian’ collection. (See my post on the Mondrian collection patterns here.) Of the five designs Richard Dormer photographed for the February/March 1966 issue of Vogue Pattern Book, Vogue 1556 is the only one shown in colour, showing off the Florence Knoll chair in the background. 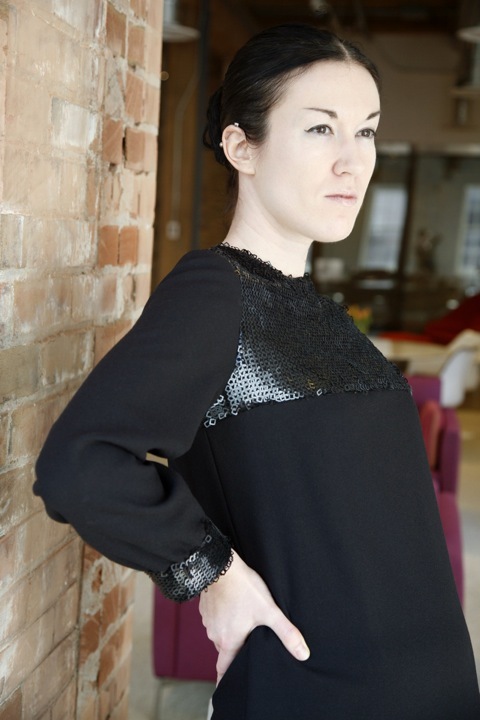 When I found a copy of the pattern in my size, it went to the top of my to-sew list. The envelope description reads: One-piece dress. Shift dress with wide contrasting yoke and hem band has long sleeves slightly gathered into contrasting band cuffs. The original was made in four-ply silk crêpe from Onondaga. Vogue 1556 by Yves Saint Laurent (1966) Illustration from envelope back. I found a black wool crêpe and Bemberg lining at Designer Fabrics, and some fabulous square-sequinned fabric on sale at Fabricland. The pattern went together like a dream. The only adjustment I made was to let the hips out a bit and widen the hem band accordingly. Luckily the hem and sleeves were just the right length without any adjustment. Underlining gives the dress that typical Sixties weight; I also used the Bemberg lining to underline the sequin fabric, but I think it could have benefited from something a little heavier. The dress fastens in the back with two separate closures: a lapped zipper for the body of the dress and buttons or snaps for the yoke. I had a lot of fun putting in my first lapped zipper. The pattern gives special instructions for the sequinned version of the dress: snaps for the upper back instead of buttons. I recommend using sturdy snaps—the light ones I used are prone to popping open. As special fabrics go, sequins are fairly high-maintenance. The sequins needed to be removed from all seam allowances and their attaching threads caught by the stitching. This could be challenging when hand-sewing the backs of the contrast bands, but the results are worth it, I think. 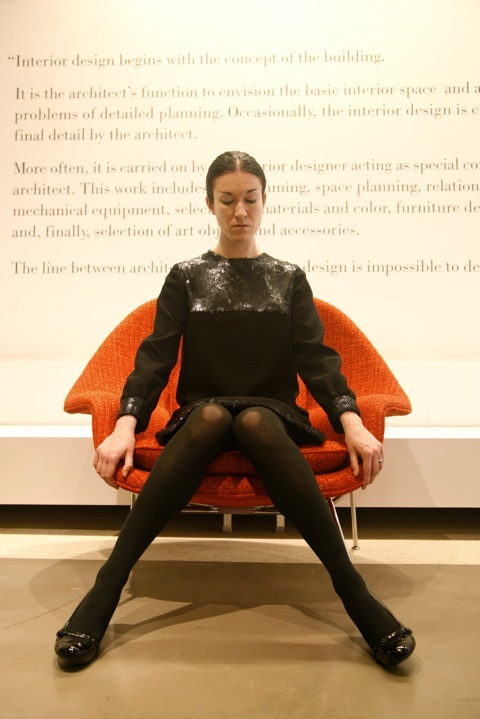 A big thank you to the Knoll staff for welcoming us into their showroom. Special thanks to photographer and friend Rachel O’Neill for her fantastic work. Everything is beautiful Sarah. The dress is beautiful, the scene is beautiful, you, the furniture, the pictures are beautiful (oggg.. I seem the master of ceremonies in Cabaret ..). I enjoyed this post, really. Thank you very much. LOL! Thanks so much, Paco. Joel Grey is my hero. Oh! That’s awesome. Now I’ll have to find some examples! Love the dress and the chairs. Ahhh, this is just fantastic! 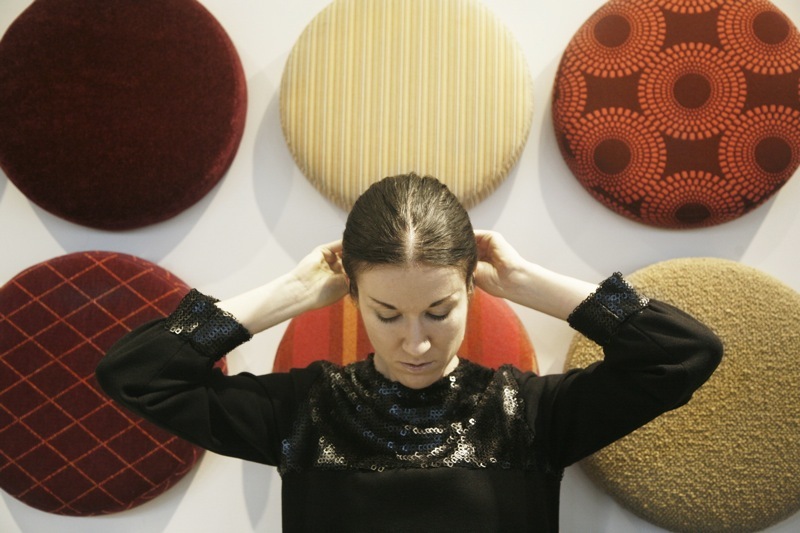 I love seeing truly mod fashions made up by fellow bloggers and I love, love, love the interior design location bonus. Thanks so much for sharing!